Since the Wii U was a bit of a failure, it seems like a lot of the games which were originally exclusive to it have jumped onto the life raft that is the Nintendo Switch in order to extend their life spans and to reach more people. 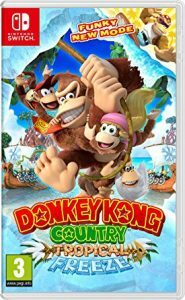 Donkey Kong Country: Tropical Freeze was one of the best games on the Wii U and it’s now also one of the best games on the Switch. If you’re thinking about buying it, please do read my earlier review before I go over the benefits of this version. Funky may not seem like much, but after beating the final boss in Original Mode, I started a new file on “Funky Mode” and felt that going through as him was a fun and different experience. There are lots of small little extras too. Donkey Kong will now play with a Nintendo Switch in his idle animation. Levels now load more quickly. A new character called Tawks (a cool parrot) replaces Funky as shopkeeper when you play as him. (I hope we see Tawks again in the future.) In Funky Mode, players now have the option to play as Donkey, Diddy, Dixie and Cranky, but with extra hearts. Finally, the song used in the credits has been replaced with a new song – I like both equally, but it’s always good to get more David Wise music. Hmm… Haven’t played a Donkey Kong game since the Game Boy! (Although, that was a very good game to play!) I could do with new games on the Switch… I’ll have to keep an eye on this one.